Montgomery County Chief Administrative Officer Tim Firestine revealed the county's furlough plan today, which calls for 80 unpaid hours off for all full-time non-public safety and non-public school employees over the next fiscal year. Along with MCPS's plans to increase class size by one student, this is a tangible sign of significant reductions in county services. The budget crisis is REAL, people. Following is Firestine's memo. The purpose of this memorandum is to apprise you of the proposed County-wide furlough implementation plan and to ask that you identify any operational or service level issues that we need to be aware of in implementing this proposed furlough plan and how you plan to deal with these issues. 1. Under the proposed plan, all full-time employees will be furloughed for 80 hours except sworn uniform police officers, uniform firefighters/rescuers, uniform correctional officers, and sworn uniform deputy sheriffs, sworn uniform merit police managers, uniform merit fire/rescue managers, uniform merit correctional managers and sworn uniform merit deputy sheriff managers (see attached chart for specific occupational classifications). The County’s Personnel Regulations are being amended to allow a furlough to be taken for less than one work day. The furlough for part-time employees should be prorated based on their budgeted annual working hours. For example, employees scheduled to work 1,040 hours per year should be furloughed for 40 hours. 2. Due to operational needs, there will not be government-wide fixed furlough days. Rather, furloughs will be implemented on a “rolling” basis, to be taken by employees, subject to supervisor approval, throughout FY11. 3. All full-time employees will be required to take 80 hours of “furlough leave.” The process will include a “bank” of unpaid leave that will be created through MCTime, and employees will be required to exhaust the 80-hour furlough leave within FY11. As a consequence, employees’ pay will be reduced by the equivalent of 80 hours (approximately 3.8%) over the course of FY11; thus, the biweekly paycheck will be reduced by 3.8%. 4. It will be incumbent upon each employee to take the appropriate number of furlough hours within FY 11. That is, 80 hours for full-time employees and a prorated amount for part-time employees. Shortly, Payroll will provide you with the appropriate pay code to enter into MCTime for furlough leave. Furlough leave must be properly coded as such on time cards. Supervisors will be responsible for monitoring time sheets for proper coding and for scheduling employees so that they will be able to take their required number of furlough hours. 5. An employee will not be allowed to count furlough hours toward the employee’s overtime compensation threshold. Under the Montgomery County Personnel Regulations (MCPR), furlough is defined as “a temporary, non-pay status and absence from normally scheduled duty required by the CAO due to lack of funds or work.” MCPR § 1-27. “A department director must compensate an employee with overtime pay or compensatory time if the employee’s total hours in a pay status during a workday or workweek exceed the overtime compensation threshold.” MCPR § 10-7(a). And, an employee must not be allowed to make up furlough hours by working additional hours at another time. A furlough is a permanent loss of work hours. MCPR § 30-2(b). 6. Since the purpose of furloughs is to produce substantive savings, employees must not incur overtime to backfill staff who are out on furlough. We clearly understand that in order to effectively and efficiently implement the furloughs, there may be a reduction in services in some areas of operation. It is incumbent upon each department director to implement the furloughs in a way that is cost-neutral and has minimal service impact. 7. By close of business Wednesday, April 14, please submit to Fariba Kassiri, Assistant Chief Administrative Officer, a memorandum that identifies any operational or service level issues that we need to be aware of and how you plan to deal with these issues. Please be as specific as possible as to which program, service or facility will be affected, types and numbers of employees involved, citizens, clients or customers to be affected, and the anticipated scope and time of any service disruption. We are planning to negotiate with MCGEO on the procedures for implementing the furlough, and will consult with you throughout this process. In addition, very shortly OHR will send you a list of frequently asked questions (FAQ) to assist you in developing your department’s implementation plan. If you have any other questions related to the furlough implementation, please contact Kaye Beckley in OHR via e-mail at Kaye.Beckley@montgomerycountymd.gov or by phone at 240-777-5041. Hello MPW readers. I’m Mike Sherling, a field associate with Environment Maryland. Environment Maryland is a statewide, citizen-funded environmental advocacy organization. Today, Environment Maryland released Building Better: How High-Efficiency Buildings Will Save Money and Reduce Global Warming, a new report that outlines the economic and environmental benefits of improving the energy efficiency of our buildings. We found that investing in building efficiency could significantly reduce our energy use, saving Maryland families $1,172 every year on their energy bills by 2030 and slashing projected global warming pollution from buildings by 37 percent. The message of this report is clear: Let’s not waste any more time, any more energy, or any more money on outdated buildings. We need to invest in efficiency today so we can start building a better tomorrow. We have the technology and skills to make buildings vastly more efficient than the ones we have today, including zero net energy buildings, which are so efficient they’re able to produce all the power they need onsite from renewable sources like wind and solar. In 2006, Habitat for Humanity set out to build a high-efficiency home in Wheat Ridge, Colorado. It wasn’t a mansion commissioned by a wealthy family, but a moderately sized home built for a single mother and her two sons. When it was finished, the house was able to generate more power than it used just from the solar panels on its roof. Projects like this prove that zero net energy buildings are not a dream waiting to be realized; there are already tens of thousands of them all around the country. Right now, more than 40 percent of the energy we use in America goes toward powering our buildings, and this amounts to almost 10 percent of all the energy used in the world. This high level of energy consumption costs Americans $400 billion every year and pumps billions of tons of global warming pollution into the atmosphere. Worst of all, many of our buildings are badly designed or lack proper insulation, so the energy we produce and pay for leaks out through poorly sealed windows or gets used up in inefficient heating and cooling systems. The good news is that it doesn’t have to be this way. Not only do we know how make zero net energy buildings, we also know how to make existing buildings much more efficient and we have a skilled workforce ready to make it happen. The Department of Energy’s Weatherization Assistance Program helps low-income families make energy-saving improvements. Over 6 million homes have been weatherized in the Program’s 30-year history, and every dollar invested has returned almost $3 in energy savings and new jobs. If we take these efficiency improvement techniques and apply them to all our buildings, we can reduce America’s overall building energy consumption 35 percent by 2030 and 50 percent by 2050. A recent study by the National Academy of Sciences confirmed that these goals are well within our reach, and we can achieve them by implementing a two-part strategy that sets strong efficiency standards for new buildings and encourages renovations to improve the efficiency of the buildings we already have. Our report looks ahead and compares these efficiency improvement targets to a business as usual scenario, and the results are striking. Meeting our efficiency goals would reduce Maryland’s projected building energy consumption by 37 percent over the next 20 years, conserving enough energy every year to power nearly four million homes. These enormous energy savings translate directly into financial savings in the form of reduced energy bills. The average Maryland family of four can expect to save $1,172 by 2030. That’s the best part about making energy efficiency improvements: they pay for themselves as consumers enjoy lower energy bills and a cleaner environment year after year. Reducing Maryland’s energy consumption would also prevent the emission of 16 million tons of global warming pollution every year by 2030, which is equivalent to taking nearly three million cars off the road. With benefits like these at stake, it’s clear that we should do everything we can to improve the efficiency of our buildings as soon as possible. We know how. What we need now are policies that will help pay for the upfront costs of energy efficiency investments and ensure that buildings and developers are taking advantage of all available efficiency improvements. • Steady improvements to building codes over time so that all new buildings are increasingly efficient, culminating in a zero net energy standard by 2030. • Investing in energy retrofits and weatherization to improve the efficiency of existing buildings 30 percent by 2030. • Supporting innovative financing mechanisms that will help consumers and businesses pay for efficiency upgrades. There are already thousands of super efficient buildings all around the country including in Maryland. Most buildings last for decades, so investing in energy efficiency locks in savings for years to come and builds a strong foundation for the future of our environment and our economy. The Gazette reported this morning on County Executive Ike Leggett's warning to the County Council about risks to the county's AAA bond rating. We have the full text of Leggett's memo to Council President Nancy Floreen and it makes for compelling reading. We also have the full text of Fitch Ratings' statement on the county's bonds, which we will be posting tomorrow. I am sending this memorandum to recommend that we jointly take additional actions to strengthen the County’s financial position in the current fiscal year and for FY11. There is no perfect time to formulate a budget. Since I recommended my budget earlier this month, we have already received more bad news that points to additional fiscal deterioration. This includes a dramatic increase in the County’s unemployment rate from 5.2% to 6.2% and may signal further erosion of income tax revenue. In addition, Anne Arundel County’s bond rating was recently downgraded from a AA+ to a AA rating due to several factors including the deteriorating condition of Anne Arundel’s reserves. At the same time, the Department of Finance has been in discussions with the bond rating agencies relative to an upcoming bond sale and is concerned about feedback they have received from the rating agencies on our fiscal position. Last week we learned through the State Department of Labor, Licensing, and Regulation that the County’s unemployment rate increased to 6.2%. The unemployment rate which averaged 5.4% between May and December ‘09, has reached an unprecedented level for the County. Our assumption prior to this announcement was that the unemployment rate reached its peak given a ±0.1 percentage point change either way over the next three months based on the recent national situation and the County’s performance since May of last year. While the data are “not seasonally adjusted”, the number of County residents employed in January was 480,493 (↓1.0% from January ’09) and the lowest level since 2004. If the January data are an indicator of the employment situation in the near term, we could expect a further strain on income tax revenues over the next six months (particularly the May, June, and July distributions) than we had estimated for the FY11 budget. Our economic assumption for resident employment assumed a modest 0.3% increase for calendar year 2010 for the FY11 Recommended Budget. This significant increase in the unemployment rate should not be easily dismissed as just “more people entering the labor force”. It is in fact, a more accurate estimate of the number of people out of work in the County which contributes to the strain on the County’s safety net services and has serious implications for future estimates of income tax revenues. The relevance of this analysis to Montgomery County is obvious given the trend in our own general fund balance and property tax cap limitations. In addition, unlike Anne Arundel County, Montgomery County is at the State authorized maximum income tax rate. As you know, like many jurisdictions, Montgomery County is in the bond market at multiple times during the year. This spring, the County is issuing bonds for its Affordable Housing Acquisition Program and seeking financing for its Ride On Bus fleet. In their analysis of the County’s credit worthiness, the ratings analysts have focused their attention on the County’s reserve levels, particularly in light of the extraordinary fiscal pressures we have faced this year. As mentioned above, a recent review of another Maryland county’s credit, Anne Arundel, highlighted the need for strong reserve levels and a structurally balanced budget. As you are aware, my Recommended FY11 Operating Budget substantially reduced the rate of growth in the County budget. Based on the dramatic decline in income tax receipts, unexpected costs related to snow removal, and other drains on our budget this year, we are projecting a reduction in our general fund reserves to $27.7 million in FY10. These reserves include $10.0 million in the County General Fund and $17.7 million remaining in the Revenue Stabilization Fund. Fuel Energy Tax Increase - In my Recommended budget I proposed raising an additional $50 million through an increase in the fuel energy tax to begin in FY11. I now recommend that we increase the fuel energy tax to raise an additional $13.6 million in FY10 and $31.8 million in FY11 for total additional revenues of $45.4 million. This will, regrettably, increase the average residential utility bill by approximately $5 per month. Accelerate FY11 Fund Balance Transfers- I am recommending that we accelerate certain planned FY11 transfers from non-tax supported funds into the County’s General Fund in FY10. This will increase General Fund resources by $3.7 million in FY10 and will not compromise the financial position of the funds from which the transfers will be taken. Reduce FY10 Set Aside - the FY11 Budget includes 63.1 million for snow removal costs. Based on a more recent estimate of snow removal costs, we can reduce this set aside amount by $3 million. The combination of these actions will produce additional resources of approximately $48.4 million for FY10 and FY11. I very strongly recommend that all of these resources be restored to the County’s Revenue Stabilization Fund to provide additional flexibility to the County in FY10 and FY11 to respond to further adverse economic and fiscal conditions. I fully appreciate the pressures that the Council is under to support additional spending in FY11 to restore pay increases for County employees, preserve County services at existing levels, address the requests from our non-profit partners, and address other important and meritorious public needs. However, it is imperative for the long term fiscal health of this County that we jointly resist these pressures in order to bring stability and sustainability back to the County’s financial condition. In closing, I want to be clear that I will not support using any of these resources to add back continuing costs into the County’s budget. All of these additional resources need to be restored to the County’s Revenue Stabilization Fund. Hoisted from the comments: Former Delegate and House Majority Leader John Hurson (D-18) weighs in on the controversy over teacher pensions. I hesitate to weigh in on this controversy but Adam is doing such a great job of imitating Blair Lee's usual flogging of the county's Annapolis delegation, I can't resist. Senator Madaleno's proposal on teacher pension funding may not be to the liking of many, but it was a smart move at the right time. The teacher pension issue (Montgomery County's state share of funding tops all other jurisdictions shares) has been a Montgomery County liability in Annapolis for decades. I was a freshman delegate in 1992 when the state shifted teacher's Social Security payment responsibility to the counties. Everyone in the Montgomery County delegation strongly opposed the shift, but the legislature did it (to us!) anyway. It was not pleasant. The teacher pension issue has been sitting there ready for the same treatment for over two decades. Senator Madaleno knows a train wreck when he sees it coming, and the inevitable shift to local jurisdictions of these costs was coming. The only question was "how" it was going to be done. By getting out ahead of this change and managing it's implementation he has done a very difficult, but important thing for the county. Sure, we would all like to believe that somehow ( persuasion, pressure, mutual friends) we could avoid this change. Yes, there is alot of deception and delusion in Annapolis. But believing this change was not going to happen is self delusion and would get us right to where we were on the shift to the locals of teacher Social Security payments in 1992--embarrassed, isolated and paying for it anyway under implementation conditions that were very difficult for the county. Senator Madaleno has managed to gain leverage for the county by his proposal, and has put us at the table as the plan gets drafted. In Annapolis, we call that leadership. The Maryland General Assembly has a bad habit of stepping all over academic freedom and interfering in the University of Maryland’s mission to educate its students during budget season. Last year’s controversy involved what films could be screened on College Park’s campus. This year’s controversy involves the clinics at the University’s law school. The General Assembly is up in arms because of the law school’s Environmental Law Clinic. Clinics allow law students, under close supervision, to do actual legal work for clients. In many cases those being represented cannot get legal counsel elsewhere. In this case, the Environmental Law Clinic has brought suit against Perdue and one of its suppliers, an Eastern Shore chicken farmer, for illegal discharge of pollutants into waterways that feed the Chesapeake Bay. The farmer’s legislators have rallied to his defense, but instead of proving his innocence they have tried to bully his accusers with budget amendments. 1. A report describing each legal case the Environmental Law Clinic participated in during the past two years including the client represented, expenditures for the case, and the source of the funds used. 2. A report on law school clinics operated at public higher education institutions in other states including the criteria they use in selecting cases. This is actually considered a compromise, authored by Senator Brian Frosh, when it became apparent a majority of Senators could not be found to stand up for academic freedom and strike the provision entirely. The House version of the budget, not yet voted on by the full chamber, apparently restricts $750,000 in funds pending a report on all of the information the Senate requires plus each case the other clinics at the law school are working on. 1. It harms the law school’s clinic program. Named after alumni and U.S. Senator Ben Cardin, the program is unusual among law schools in that every student must take a clinic. At most schools, clinics are difficult to get into and highly competitive. The University of Maryland guarantees that every student will have clinical experience. 2. The clinics all operate differently, so a report on how law school clinics operate is not particularly useful. For example, in the Criminal Defense Clinic I participated in, I was paired with a federal public defender who assigned me cases. Is the General Assembly intending to vet those cases? I am confident the cases I worked on would not win any political popularity contests, but those defendants needed a lawyer (or law student in my case) regardless. 3. What message does this send to law students? It is already a challenge to get debt saddled students to choose careers in public service or public interest law over corporate firms. Now, their elected politicians are cracking down on those kinds of efforts? 4. Am I crazy or does the General Assembly not spend a lot of time lamenting the state of the Chesapeake Bay? We all know that discharge into the bay, whether from run-off or dumping, is a big problem for the Bay’s health. Why does the General Assembly want to stop efforts to use the legal system to heal the bay? 5. But the biggest issue is the academic freedom issues raised by this requirement. What happens when a University of Maryland Professor writes a book the General Assembly does not approve of? Will they withhold funds until the school issues reports to the legislature’s satisfaction? What if next time they decide to withhold funds until the professor is dismissed? Where exactly does the General Assembly draw the line? The issue is fast moving, but I believe there will be a vote to strike the amendment from the budget in the House of Delegates as soon as tomorrow (Thursday, April 1st). Please encourage your legislators to stand up and do the right thing to support academic freedom, the University of Maryland School of Law, its clinic program, and its students. Disclaimer: I am a student at the University of Maryland School of Law and participated in the Criminal Defense clinic in 2009. I know some students in the Environmental Law Clinic at the heart of the current debate. If you had a choice between getting endorsed by the Post OR getting on the Apple Ballot, but not both, which of the two would you pick and why? 1. I’ve been elected before with endorsement from the teachers and not the Post. 2. People coming to the polls usually only take the Apple Ballot in with them when they go in to vote - they count on it. * I believe the Apple is respected by voters and especially teachers. However, I believe the WashPost is even more well known and even more widely respected. Walk up to an average person on the street, ask them what the Apple Ballot and the Washington Post is. They will likely know the latter but not the former. The Washington Post is a revered and historic institution (see: Woodward/Bernstein). * The Apple Ballot has a good record of winning in 2006 MoCo races. However, they often endorse candidates who are more likely to win anyway. So their record has to be taken with a grain of salt. The MCEA will endorse people based on politics of who they owe favors and whom they need to work with after the election. I believe the WashPost is more principled since they don’t need to worry about contracts or worry about retribution from politicians who were jilted. * Last time after I was endorsed by the MCEA, I was asked to pay $6,000. Would be great to save that money. * There is a possibility that the War that the WashPost is waging on MCEA will reduce the effectiveness of the Apple Ballot. But the MCEA is unable to diminish the Post’s effectiveness. I think it might be difficult for the MCEA to solicit its endorsed candidates for $$$ since the WashPost has raised such a stink about it.... So if they have less money to publicize the Apple, they will be less effective. I would prefer the Apple Ballot - more people are influenced by it. If the election were held today… Apple Ballot by a nose. In a local race where schools and education rate near the top of what voters deem most important, the teachers’ endorsement is instant credibility. For someone running at the federal level, the Post probably noses out Apple Ballot in terms of influence over voters. The Post because with my record on education there is no way I could lose the real support of teachers who vote in my district. Besides, an editorial opinion by the newspaper of record is like pure gold. Tough call. When push comes to shove, I’d take the Post endorsement if I had the ground forces to pass out reprints of it. If not, I’d take the teachers because those guys have serious coverage on the ground. Toss up. The Post endorsement would normally trump in my opinion but because the paper waits until the Sunday before election day to typically make its selections, it’s not as useful to candidates as it otherwise would be if they endorsed a few weeks earlier. We have to run through hoops in 24 hours to try to print materials that say “Endorsed by the Washington Post” and it is costly. The Apple Ballot endorsements are done early enough in the year to include their logo on our yard signs and other materials. Not to mention how helpful it is to have MCEA/teacher volunteers passing the ballot out at each polling place. As far as the voter is concerned, I think they appreciate the viewpoint of both sources. Perhaps for BOE and County Council candidates, who have more control and impact on the education process in the county, the Apple Ballot carries extra weight. With state legislators, we handle so many more issues than education, that the WaPo endorsement is more a statement of the entire candidacy and on a range of issues. I believe that the credibility of the Post is weak. Older people seem to take the Post seriously, but the younger voters and more diverse communities do not. Social networking tools, blogs and radio play a stronger role. Teachers are very well regarded, and the school system has worked hard in creating a collaborative environment based on student achievement outcomes. The Post. At the end of the day, the Apple Ballot is a tool of a special interest group, albeit one I support. The reality is that they are only concerned about their teachers. Meanwhile the Post, I hope, would base their endorsement on a variety of factors. Dem voters use the Apple Ballot to cut through the clutter and confusion of down-ballot candidates and issues. They don’t know who we are, but they know they like teachers and education. If we’re good enough for the teachers, we’re good enough for them. Apple Ballot, hands down. The Post is well and good, but the Post is not going to be doing mailings, buying TV time, and deploying an army of teachers on a day off from school standing at the polls handing out literature with my name on it. In our system where state and county officials are on a crowded gubernatorial ballot every four years in a closed primary with low turnout and low name recognition of candidates, and no threat of a challenge in the general election, the Apple Ballot carries much more weight than the Post. Easy. Apple Ballot. Has nothing to do with clout. Everything to do with my values. I don’t give a ______ about what a newspaper thinks. Apple Ballot. People are still more likely to grab an Apple Ballot when they walk into a polling station on Election Day and early voting days. There may be less luster with the Apple Ballot due to recent Post editorials, but there are less and less Post readers these days so negative media will not have much impact on views towards the Apple Ballot. Perhaps if the negative media occurred a few years ago, then it might have had a greater impact on the Apple Ballot. I think less people care who the Post endorses with each passing election. It is still a worthy endorsement - to get the Post endorsement - but I think its impact is diminishing and will continue to do so. The Post presumably looks at a Council Member’s total record; MCEA has a narrower focus. Therefore, a Post endorsement is more substantial. As to which has more impact, that is a close call, and may be different for each individual District Council Member, depending on their district, than At-Large Members. If the unions behave “badly,” make a fight out of pay issues which will likely be off the table because of how bad things are, then they are going to offend many voters. More so, because in the primary these are the voters who pay most attention. I have yet to talk to anyone who says raise taxes, protect union raises, I’m happy to pay for it. Unions could poison the water by pushing too hard and tarnish the value of their endorsements. On the other hand, if they’re proactively part of the solution, they could get big credit for helping the county get over the hump. Or they could hand the Post an issue that they’ll beat elected officials to death with. The Apple is worth more than any other union endorsement, but not if we get in a major fight over the budget. If that’s avoided, and the Post is deprived of this issue, then Apple trumps Post. I think the Post editorials have been damaging, judging by the comments I’m seeing, but it’s February and will be hard to keep alive. But a budget fight changes everything. Look at it this way, the data shows income loss in virtually every income bracket. COLAs and steps against a background of declining incomes for very many county residents will be a story that keeps on giving for the Post. The truth is that the Post and the Unions have largely endorsed the same candidates, so a scenario that was either/or would not be a good scenario. If you had asked me a couple of years ago, I would have said the Post. Interestingly, given the number of negative editorials the Post has written about the Council and various issues over those past two years, I would have anticipated that there would have been a real increase in negative reaction associated with those articles because that tended to be the case previously when the Post wrote similar pieces. I have been surprised that there has been very little response on the part of County residents which would lead me to believe that either people aren’t reading the editorials, or don’t care what is being written. Either way it shows a pretty significant decline in influence. I am not sure that I consider the Apple Ballot the holy grail, but if you have a crowded field in an at-large race or even a district primary I think it would be much more helpful to have the Apple Ballot, because at the end of the day it is also feet on the ground at polling places and is a good brand being handed out to voters by teachers which also puts a good face on the candidate they endorse. The Post, although both endorsements in general matter less than they used to. The Post has fewer readers, so the time that candidates have time to publicize the endorsement, along with the number of voters who vote early (possibly before the Post endorses), makes a potentially big difference, and the general reputation of pubic employee unions has declined. This year I think the Post will matter more than the Apple Ballot, because I don’t think it will be much if any advantage to candidates this year to have union endorsements because of the unwillingness of union leaders to fully and publicly recognize the severity of the budget problem and agree that ANY pay raises are out of the question. In fact, furloughs are all but certain. The more that unions argue or hold out for any pay raises, the more they hurt themselves with the general public. If union leadership continues to hold out, it could be that union endorsements will hurt a candidate this year, even in a Democratic primary. Since teachers are not generally viewed by the public as a typical union, and since the teachers union is the largest, the teachers endorsement will continue to be the most important union endorsement. In addition, if the Post runs numerous editorials, as they have, that describe union influence as outsized and connect it to unaffordable pay increases and tax increases, that increases the influence of the Post's endorsements. One other difference: as a humorist once noted, not many organizations buy ink by the barrel, as does the Post. I’d pick the Post as long as they did it far enough in advance to get the word out. Sometimes, they endorse so close to Election Day that it doesn’t matter much. The Apple Ballot, of course. The Post did not endorse me in my last election; MCEA’s Apple has endorsed me every time - and I got ELECTED!! Enough said. Off the record, MCEA has data showing a stronger response to the Apple Ballot endorsement than to the Post endorsement. Off the record as well, at this point as a voter I wouldn’t trust either one. The Post doesn’t know what it is doing most of the time in local elections and can be easily bamboozled by a few well-placed phone calls from certain people. In large election years, it endorses people for local office that the editors have never even met. If your name is on the Apple Ballot, the voter just has to guess about why exactly you are there - it may be mostly because of your positions, it may be mostly because of your race or gender or sexual preference (being the right identity at the right time), it may be because the union leadership wants to send someone a message. One thing is for sure - it is not primarily about the candidate’s commitment to what the kids need, unless you believe that what is good for MCEA is good for the kids’ education (just like what is good for GM is good for America). Of course, the union leadership really believes with unquestioning faith that this statement is true. Easy: I would pick the Apple because it is closer to my values (support for teachers, support for working people, belief in education) than the Post (arrogant union-busters). Even if I lose the election, I would rather stand with teachers than with the cynical elitists who comprise the Post’s editorial board. However, the real question is: who would you rather punch in the nose: Lee Hockstader or Jon Gerson? The answer to that one is not so easy. Both are little tyrants who believe they are entitled to exert disproportionate control over county politics. The above sample constitutes about half of all MoCo elected officials at the county and state levels. While most of them respect both endorsements, twelve expressed a preference for the Apple Ballot, six expressed a preference for the Post and four did not have a clear choice. Let’s bear in mind that these opinions were given in the immediate aftermath of three Post attacks on MCEA in three weeks. We will bring some data to this debate tomorrow. -Whether a strategy whereby State Senators and Delegates from Montgomery County would band together to resist the shifting of teacher pension costs could succeed. Thursday, April 1st at 9:00 p.m.
Tuesday, April 6th, at 9:30 p.m. Following is a press release detailing a cable TV call-in show to be held by County Executive Ike Leggett and County Council President Nancy Floreen on Wednesday night, March 31, 7:30 to 8:30 p.m.
ROCKVILLE, Md., March 30, 2010—Montgomery County Council President Nancy Floreen and Montgomery County Executive Isiah Leggett will co-host a live, televised call-in show on County Cable Montgomery (CCM) on Wednesday, March 31, from 7:30 to 8:30 p.m. The show will be broadcast live on County Cable Montgomery (Channel 6 for RCN and Comcast subscribers, Channel 30 for Verizon subscribers). In addition to questions from callers, the elected officials will answer questions from residents who were videotaped in downtown areas of the County and they will respond to recent correspondence sent from residents. The regular series of call-in shows co-hosted by the County Executive and the County Council President are part of Montgomery County’s efforts to foster open dialogue and communication on the important issues facing the County. The officials will answer residents’ questions on any topic of local concern. Environmentalists Say Legislators Are "Giving the Environment the Shaft"
Environment Maryland is claiming that the General Assembly is "giving the environment the shaft this year" and that, "the Chesapeake Bay is getting thrown under the election year bus in favor of campaign contributions." Its State Director also says, "I've never seen special interests get their way so universally... Bankers, developers, truckers, utilities, and chicken companies are getting their wishes granted by our state legislature." Following is their press release. Annapolis - Today is the crossover deadline in the Maryland General Assembly, the date by which bills must be passed out of one chamber to be guaranteed a hearing in the other chamber. In reviewing their priority bills, Environment Maryland sees little progress being made. The 2010 Chesapeake and Atlantic Coastal Bays Trust Fund will likely be cut significantly, with remaining funds limited to cover crops. The Senate voted to continue diverting energy efficiency funding (RGGI funds) in FY 2012. Program Open Space is being raided. The Sustainable Communities Tax Credit (SB 285/HB 475) is not moving. Both sides have passed funding restrictions for the University of Maryland Environmental Law Clinic. HB 522 and SB 910, common-sense bills for comprehensive energy planning, are going nowhere. A bill to help property owners afford clean energy projects (HB 1014) has been gutted. An energy efficiency standard for televisions was killed in the House (SB 455/HB 349). SB 558/HB 1224, which would have helped establish long-term contracts for clean energy, is dead. A bill encouraging market expansion of biofuels (SB 569/HB 827) is being held by the Economic Matters Committee. HB 1125, which passed the House, will grandfather an unknown number of development projects that will be exempt from upcoming stronger stormwater management standards. SB 686/HB 999, which would create a dedicated source of funding via small fees on utility bills for a backlog of urban stormwater management projects, is stuck in the drawer. SB 859/HB 953, which would ban arsenic-laden additives from chicken feed, is sitting in committee. An amendment that would prevent oyster sanctuary expansion before 2011 was added to SB 342/HB 1191, a good bill to crack down on oyster poaching. A bill to prevent toxic pollution from coal ash dumpsites (SB 653/HB 1467) is in the drawer in the EHEA Committee. A bill to reduce plastic bag litter by creating a fee on single-use bags has been killed (SB 462/HB 351). Three recycling bills have been voted down – recycling at apartment buildings (SB 156), recycling at bars and restaurants (HB 944), and increasing our recycling goals (HB 982). Transportation: The House today passed HB 1155 which will help make transportation spending line up with the state’s official smart growth goals. Energy: Bills have passed both chambers to improve our net metering law, requiring utilities to pay for excess power generated by solar power or other on-site generators – SB 355 and HB 801. Solar power: The Administration bill to accelerate the solar energy standard (SB 277/HB 471) passed out of the Senate Finance Committee. Chesapeake Bay: The oyster poaching bill (SB 342/HB 1191) might get through with the bad amendment removed. Budget: The House Appropriations Committee decided not to continue diverting energy efficiency funding in FY 2012. Now it’s up to the conference committee. “Newspaper editorial pages are entitled to their own opinions—but not to their own facts. That seems to be a distinction that The Washington Post has a hard time making these days.” Such was the observation of Peter Hart of Fairness and Accuracy In Reporting nearly four years ago. Certainly, nothing has changed at the Post. On behalf of the Post’s bosses, an anonymous opinion writer, has both fabricated a false premise and used an out-of-context statement that I made during one of several conversations with Post reporters, including one lasting 39 minutes, as an excuse to once again attack and attempt to demonize Montgomery County, Maryland employees. In an opinion published on Sunday, March 14 (“Please, don’t make us cheat!”), the Post made false and typically puerile accusations about county employees. This time the target was honest, hardworking, dedicated police officers who don’t need to be defended against spurious attacks by a gang of closed-minded and obsessed media thugs down in Washington, DC. Post bosses have minimized the county’s mismanagement of the tuition assistance programs, but singled out for “special mention: the reaction of the police union to the inspector general’s report” on tuition assistance. The inspector general’s report on tuition assistance was released on Monday, March 8. (See Report on Md. police tuition aid cites poor oversight, abuse, W. Post, Tuesday, March 9, 2010.) The alleged “reaction” over which the Post feigns outrage was taken from of an article written after a series of conversations I had with Post reporters. Each of those conversations occurred days before release of the inspector general’s report, specifically on March 3, 4 and 6. Importantly, I did not see (or know the contents of) any inspector general’s report until days after it was made public on March 8. The Post made it up. There was no “reaction” “to the inspector general’s report.” It simply didn’t happen! How ethical is that editorial? The Post knew, and even partially reported, that there are at least four education and training programs in Montgomery County. These programs are: (1) Employee Tuition Assistance Program for Police [“Police-ETAP”], (2) ETAP, (3) Job Improvement Tuition Assistance Program [“JITAP”], and (4) Police Training Funds. Only Police-ETAP and Police Training Funds are available to police officers under terms of our collective bargaining agreement. JITAP was offered but rejected by the FOP in 1989 – 21 years ago – and is specifically excluded from our contract. Police Training Funds are administered by the police department while JITAP and two ETAP programs are administered by the Office of Human Resources. Amazingly, to date, we have not been contacted by either an investigator or the inspector general. Referring to the County’s administration of the Montgomery County Police-ETAP and management’s approval of applications for training that did not qualify under that program, I commented to a Post reporter: “You're management. You're in charge. Don't approve it," This statement was not in reaction to any report. Rather, it was made in the context that training courses identified by management as “JITAP” were approved for payment by county management even though the JITAP program is not part of the police tuition program and management knew, or should have known, that. My statement also was made with knowledge that certain religious courses had been approved by OHR management in violation of its own 1985 written determination. These comments are consistent with what I told the Examiner as reported on December 13, 2009 where I “faulted county administrators for not enforcing existing rules, and said new rules aren't needed…. ‘The management side is broken, there's nothing broken with our contract.’"
The Office of Human Resources was delegated responsibility for administering tuition assistance benefits and had a fiduciary duty to review applications and either approve or disapprove them under terms of the various collective bargaining agreements. A tuition assistance application is a request, not a guarantee. Each application must be reviewed for compliance with the applicable program. There is no dispute that management received training requests from police officers, classified them as JITAP, but approved them anyway. In speaking with the Post reporter, I stated more than once that I was commenting on the police tuition assistance program and training funding in general, but not the funding of training involving discounted guns since that matter was the subject of a civil suit filed by the county. Early on March 7, I e-mailed to the same Post reporter a chart showing the FOP’s analysis that during slightly more than three fiscal years, a whopping $742,000 out of a little more than $1 million was spent on ineligible JITAP training. I also e-mailed to the same reporter a copy of the October 2, 2009 grievance. As I told the reporter on March 6, we have recently learned that police management may have been supporting the use of tuition funds (under JITAP) as a substitute for police department training funds. Officers have merely relied upon management’s representations and actions. Clearly, the police tuition system was so poorly administered that the scope expanded far beyond the parameters allowed by the collective bargaining agreement. Employees were led to believe that the program was more comprehensive than intended and, consequently, made application in good faith fully expecting that management would make the proper determination as to eligibility. Post bosses didn’t do their due diligence either. Without regard for the facts, they claim that I “couldn’t find anyone to blame but management.” Based upon the facts available, I do fault management for not properly administering the benefit, for violating the contract, and for changing forms and procedures that improperly opened JITAP to police officers – and led officers to believe that the benefit had been expanded. I have concerns that management promoted JITAP as a substitute for department training funds which would have required supervisory endorsement. Further, without benefit of either facts or context – or in blatantly disregard of both – Post bosses proclaim to speak for me by saying that “in [my] view, of course police officers will be crooked if given the opportunity!” Not only is the Post flat out wrong about police officers, they are not in a position to speak for me. It seems that the Post and its opinion writer are so fact deficient, self-absorbed and venomous that they are incapable of reason. For Post bosses to assume that my opinion about the county’s mismanagement of a tuition benefit constitutes a “worldview” is just dumb. The Post bosses’ allegation that the FOP itself had insisted on OHR tuition assistance approval without going through supervisors is flat out false and contrary to what OHR has said in the past. It doesn’t take an extra layer of bureaucracy to determine if a course is offered at a college or university. The Police-ETAP is the oldest tuition program in the county and historically has not required supervisory approval. However, nothing in our contract prevented OHR management from consulting with police management about any training or application. The current approval process was promulgated by management, not the FOP, and merely subsumed into our first contract back in 1983. Remember, it was not ETAP that was at the center of the mismanagement, it was JITAP. JITAP does require supervisory review. The county’s OHR categorized most of the questioned training as JITAP. OHR simply should not have approved JITAP for any bargaining unit police officers and instead referred them to the department training fund. Facts get in the way of every good story – except at the Washington Post. Walter E. Bader is the Executive Director of the Fraternal Order of Police Lodge 35. By Patricia B. O’Neill, President, Montgomery County Board of Education. Last week, in a surprising move, the Maryland Senate voted to transfer hundreds of millions in teacher pension costs from the state to local governments out of concern that the expenditure is unsustainable. As president of the Montgomery County Board of Education, I must say that this was a total surprise to us, especially given that the move was championed by one of our own legislators, Senator Rich Madaleno. It is comforting for now that the proposal appears to have stalled, with the House Appropriations Committee recommending a study of the implications of the cost shift. It is the right and respectful thing to do, and Delegate Norman Conway, chair of the committee, is right; a seismic shift of this magnitude should only be undertaken after a comprehensive study involving all stakeholders. At the very least, those who are going to be affected adversely by this shift should have been aware of this instead of reading about it in the papers and blogs. This is nothing personal against Senator Madaleno. Here in Montgomery County, we love and respect Senator Madaleno. He is usually a trusted ally who fearlessly goes to bat for Montgomery County using his intellect, charm, and boundless energy. It was, therefore, a stunning shocker when we on the Montgomery County Board of Education learned, without any prior warning, that he had introduced legislation that would shift in yearly installments the obligation for teacher pensions to local jurisdictions. We wish he had spoken to us before hand. If this legislation passes, it will be hard to find in the history of Montgomery County a more devastating fiscal blow delivered by one of our very own. There is no one that I have spoken to that understands why Senator Madaleno chose to lead this fight that could in essence jeopardize the retirement income of the teachers and staff of Montgomery County Public Schools. Senator Madaleno has tried to explain why he decided to sponsor a plan to shift these funds from the state to the local jurisdictions. It is very simple, he says, the system in its current form is unsustainable. If this is correct, then, it is puzzling how merely shifting the burden to counties solves the problems. The only explanation would be that the proposed legislation is a Trojan horse carefully designed to force a conclusion to Madaleno’s thesis – that the pension plan for our hard working teachers and staff is unaffordable and unsustainable. Let’s be clear — the cost to Montgomery County of the Madaleno-inspired shifts would be staggering, and in this climate quite simply unaffordable. Senate staffers have calculated that it would cost us $13 million in FY 2012, $41 million in FY 2013, $69 million in FY 2014, and $70 million in FY 2015. Let’s also be clear — if this bill passes, the options are limited and unpalatable. These are funds that would be competing with other needs. If taxes are not raised, our staff would be forced to absorb the expenses through reduced pensions or vastly increased employee contributions to the pension fund. These cuts, if passed on to Montgomery County Public Schools (MCPS), would be devastating. The effect would be to decimate our instructional program as we know it today. These cuts could represent losses of hundreds of teachers; as many as 140 in FY 2012, 440 in FY 2013, 740 in FY 2014, and 751 in FY 2015. The county is already reeling from the effects of a global recession, and the Board of Education has been working closely with the County Executive, County Council, and our unions to brave a very tough fiscal climate, beginning with this year when our unions agreed to forgo $79 million in raises in order to close the fiscal gap. For next year, the school system has had to accept an unprecedented $137.7 million in additional cuts. As we struggle with these cuts, we are doing everything in our power to avoid cutting those investments that have made a difference in the lives of our youngsters. I have been on the Board of Education for more than ten years and I have not seen anything quite like this. In all of this financial tsunami, I have been impressed with the cool-headed approach of the leadership of all our unions representing our teachers, support staff, and administrators. They have shown a great willingness to work with us through these issues. The timing of this legislation couldn’t have been more inappropriate. I call upon Senator Madaleno and all our representatives in the name of all that is fair and decent to fight this pension shift. It could have devastating consequences to our teachers and staff. Beyond the fiscal cost, the loss in morale for staff that is faced with forgoing any salary increases again next year is incalculable. We have always prided ourselves on ensuring that the best and committed are retained in our classrooms. This we do by compensating them fairly and ensuring that their wages and classroom preparedness are on par if not superior to neighboring jurisdictions. This proposal is a giant step backwards in that regard. Our teachers and staff deserve better than this. Finally, I believe that any attempt to compromise what our teachers and staff have earned in terms of their retirement is, quite simply, morally wrong. The pension plans for MCPS employees have been unfairly compared to those of employees in the private sector. When most employees in the private sector were investing their defined contributions in the financial markets, our employees were earning the same in the form of defined benefits that they would need in their retirement years. Our employees did not have the flexibility of investing these funds themselves and presumably making a substantial profit. By working in our classrooms, they chose a conservative option of earning their benefits over the years. What Senator Madaleno’s proposal does ironically is to put at great risk the earned fruits of the hard labor of the incredibly dedicated men and women that toil daily to secure the future of our children. That is just not right. The economic challenges that we face today are not for a single individual to bear alone. As elected officials, we are a team sworn to protect the interests and the future of our citizens. A key part of that problem solving is communication and dialogue. What just happened is a sobering commentary on how we conduct business – in silos, with little connections to each other. As President of the Montgomery County Board of Education, I pledge on behalf of the Board that I will work alongside all key players to ensure that our delegation in Annapolis fights for and represents our interests. These times that we live in call for nothing less. This year was supposed to be a lean year in the statehouse. Cuts were everywhere. Furloughs and pink slips were being handed out left and right. State aid and teacher pensions were on the chopping block. But somehow, the Prince George’s County state legislators were able to bring home an extra $18 million. How did they do it? Take a seat, folks, because class is in session! The Prince George’s delegation, also known as “the PeeGees,” is the second-largest county delegation in Annapolis. Six Senators and eighteen Delegates represent Prince George’s County alone. Two more Senators and five more Delegates have split districts that include pieces of Prince George’s. One of those Senators is Senate President Mike “Big Daddy” Miller, who has priorities that go far outside the county. The delegation has three standing committee chairs: House Economic Matters, House Judiciary and Senate Budget and Taxation. The group is more diverse than most people appreciate, ranging from do-gooder liberal Senator Paul Pinsky (D-22) to ethically-challenged, head-breaking Senator Nathaniel Exum (D-24) to young, wonky Delegate Justin Ross (D-22) to old, gruff House Judiciary Chairman Joe Vallario (D-27A) to smart, savvy House Economic Matters Chairman Dereck Davis (D-25), a potential future Speaker of the House. Senate Budget and Taxation Committee Chairman Ulysses Currie (D-25) is one of Big Daddy’s top lieutenants and makes sure his committee never strays too far from the boss. The Senators are all men, but a pack of young, hungry female Delegates is breathing down their necks and may someday take a couple of them out. One spy says, “They are great street fighters. O’Malley fears them. They are the ‘victimized’ and they all believe it. They are much better at the ‘game’ – they take it personally, they take pride in ‘winning,’ and they are held accountable for playing it well by churches, etc. – not just one union.” The only sense of victimization felt by many MoCo legislators is the fact that they have not yet been elected to Congress. As powerful as the PeeGees are, they have a problem: despite the incompetent administration of County Executive Jack Johnson, the county’s wealth is growing relative to the rest of the state. You might think that’s a good thing, but not in Maryland. The state’s wealth formulas punish economic success by diverting aid away from rich counties towards poorer ones. In the Governor’s FY 2011 budget proposal, Prince George’s was scheduled to take a 3.0% cut in aid, the biggest drop in the state. That’s just disrespectful, and no one disses the PeeGees. Here are the three things they did to turn the tables and bring home eighteen million slices of bacon. As of February 2010, 57% of Montgomery County registered voters were Democrats and the county votes overwhelmingly Democratic in every statewide election. So there has always been a sense that Democratic Governors can take MoCo for granted and hand out goodies for votes elsewhere. But 78% of registered Prince George’s voters are Democrats. Why doesn’t the same conventional wisdom apply to them? The reason is because Prince George’s support does not come for free. They make a Governor work to get it. Three years ago, the biggest issue in the county was its deteriorating hospital system, which was on the verge of outright collapse. Governor O’Malley moved to save it by pouring tens of millions of state dollars into the system until a buyer was found. Meanwhile, the county government is trying to weasel out of its own payments to the hospital. …I have not endorsed anyone for Governor. Quite candidly, I think it is premature to endorse anyone until after the 2010 legislative session has been completed. Then, and only then, will I be able to make an informed decision about what’s best for the community I represent. Translation: Give us a little more, Governor. That opinion was shared by the legions of Prince George’s politicians who swarmed into potential primary challenger Wayne Curry’s birthday party. The party was a bombshell that scattered shrapnel all over Annapolis and in hindsight was one of the best things to happen for the county. So isn’t this ungrateful behavior by the PeeGees? Of course, but it also creates the most valuable commodity in politics: leverage. And O’Malley’s promise to help the county in its quest for more aid was a direct response to such tactics. Brice responded that O'Malley would try to bring all lawmakers together and work with them on the budget. “As long as he is aware,” Exum shot back. Delegate Justin Ross followed up with a bill to change the school aid formula, telling the Post that it was a “fairness issue.” The bill was voted down by the House Ways and Means Committee, but the PeeGees had laid down their marker for 2010. This year Ross reintroduced that bill, which would have generated $39.6 million in new school aid for the counties. Prince George’s would have received $13.4 million, the most of any jurisdiction. Charles County would have been second with $4 million. MoCo would have received zero dollars. The PeeGees began sniping at MoCo in the Post over aid even though they were already getting FAR more aid than MoCo. Clearly, the PeeGees were not going to give up. O’Malley and the General Assembly leadership got the message. There are three ways to get allies and cut a deal: persuasion, pressure and working out mutual gain. The PeeGees used all three to fix their aid problem. Persuasion: The case made by Ross for a formula change involved the appropriate timing to determine wealth. Current state wealth formulas are based on tax returns filed through August 15 or September 1, but wealthy people often get extensions and file later. Ross and the PeeGees argue that undervalues the true wealth of jurisdictions with a lot of rich people in them, like MoCo, so they want to move the formula date to November 1. MoCo budget expert Senator Rich Madaleno (D-18) bought that argument, telling Ross that he had made a “compelling case” for changing at least one of the state’s formulas. Ross said, “Prince George’s County has no greater friend than Montgomery County in the legislature.” Oy! Pressure: This is the product of the leverage and persistence discussed above. O’Malley needed Wayne Curry out of the way and the PeeGees were not going to cooperate until they got some bacon. As a result, the General Assembly’s leadership understood the importance of taking care of Prince George’s. Mutual Gain: No budget bickering occurs in a vacuum in Annapolis. Everybody has complaints, and those who want to play ball can get some relief. This year, Baltimore City, MoCo and Prince George’s were each thrown a bone. The city got to keep the street maintenance money that some other jurisdictions were trying to take away. MoCo got to escape its Maintenance of Effort (MOE) fine. And the PeeGees got a change to the wealth formula covering disparity grants, which subsidize “poor” jurisdictions, that gave them $18 million. (They’ll be back for the much-larger education formula next year, and that will cost MoCo big-time.) So the city got to keep something it already had, MoCo avoided a fine it should never have had to pay and Prince George’s got brand new money. Who do you think made out the best? Let’s not overstate our case. There are no LBJs running around the Prince George’s delegation and they have problems like everyone else. A few of them are deadwood, a few of them are banana-cakes and at least a couple of them are probably crooked. But as a group, they know how to squeeze the orange and get some juice to come out. Now compare the above to our legislative “strategy” on teacher pensions. Our plan to avoid having Big Daddy stick it to us next year was to stick it to ourselves this year. Leverage, persistence, pressure, negotiation, posturing, recruiting allies, lining up votes, tough bargaining – you know, all those unsavory things that Big Daddy and the PeeGees do – well, some of our guys are too good for that. Others just don’t care because they are in Annapolis for other reasons. “Frankly, funding Ike and Nancy Floreen’s pet projects doesn’t get me out of bed in the morning,” sneers one MoCo delegation member. Hear that? That was the bell. Class is dismissed. Montgomery Village Foundation President Bob Hydorn has filed to run for the office of Delegate in District 39. Montgomery Village occupies much of the northern part of the district, which curls like a "C" to the north and west of Gaithersburg. The incumbent Delegates are three-termer Charles Barkley, freshman Saqib Ali and appointee Kirill Reznik. Barkley and Reznik are expected to run again for their current seats. Ali has been making a lot of noise about his disagreements with Senator Nancy King, who beat him out for the Senate appointment in 2007, but he has not announced whether he will challenge her or stay put. Hydorn starts with a nice geographic base but the incumbents have a head-start on him in making the rounds of the district. Following is Hydorn's announcement email. This past Friday I filed what the State of Maryland Board of Elections calls "Certificate of Candidacy - 2010 Gubernatorial Primary Election" form, and SBE/CCF #5-304 IS "Candidate Information Sheet." The forms are attached for public review. The following are some of the key elements that I will be representing my constituents for in Annapolis. * Maryland's reputation for excellence in public education is on the slide/ has been eclipsed by neighboring jurisdictions. I will work to restore excellence in our schools. * Small businesses are fighting to keep a footing in our state. I will support the needs of the small businessman/woman, because small business creates the majority of the jobs in America. * I will fight to bring accountability and fiscal responsibility back to Annapolis. Government must learn to live within its means, just like any Maryland family. * In my district, the police and fire services have eroded to dangerous levels. I will work to raise the level of staffing and resources for our police and fire services, to ensure the safety of our communities. Last week, Council District 1 challenger Ilaya Hopkins proposed a series of debates with incumbent Roger Berliner and he has agreed to at least one of them. On June 1 at 7 PM, the two will debate at the Town of Chevy Chase Town Hall at 4301 Willow Lane. This is the backyard of East Bethesda resident Hopkins and the stronghold of Purple Line rail opponents, with whom the pro-rail incumbent has disagreed in the past. Following is the press release from the Berliner campaign. Bethesda, MD (March 29, 2010) – Incumbent County Councilmember Roger Berliner (D-1) announced today the first of what his campaign hopes will be several debates in his bid for re-election. On June 1, 2010 at 7 p.m. in the Town Hall, the Town of Chevy Chase, along with Somerset, Chevy Chase West and East Bethesda, will co-sponsor an event to be moderated by Charles Duffy, host of Channel 16’s Political Pulse. “I look forward to discussing my record of working hard and getting results for the residents of District 1,” said Councilmember Roger Berliner. Berliner, a lifelong Democrat and the first Democrat ever elected to represent District 1, was recently voted “Best County Councilmember” by the readers of Bethesda Magazine. Roger Berliner was first elected to the Montgomery County Council in November 2006 when he defeated the incumbent Republican by 12 percentage points. He currently serves as Lead Member for Energy and Environment on the Council’s Transportation, Infrastructure, Energy, and Environment Committee and is a member of the Public Safety Committee. He also serves as the Council’s representative to the County’s Sustainability Working Group and Green Economic Task Force. Regionally, he is on the Washington Regional Board of Directors of the Council of Governments, and serves as Vice Chairman of COG’s Climate, Energy, and Environment Policy Committee. · Comprehensively addressing our traffic nightmare by sponsorship and passage of a tough new transportation test for development; proposing that Wisconsin and Connecticut Avenues be designated by the Governor as Sustainable Transportation Corridors; and providing incentives for developers to commit to taking action that will result in fewer cars on our roads. · Sponsoring and passing 8 major energy/environmental initiatives that include the groundbreaking Home Energy Loan Program, a tax credit for solar energy, and a consumer measure that gives homebuyers information on how much their new home will cost to heat and cool, a measure the state legislature is exploring adopting for state-wide applicability. · Successfully fighting to protect our quality of life by sponsoring and passing comprehensive McMansion reform; preserving the open space at the heart of Bethesda on Woodmont and Bethesda Avenues; and preserving the historic viewshed of the C&O Canal from unsightly development. · Fighting to preserve the quality of our school system by sponsoring and passing the amendment to the growth policy that ensures developers contribute where schools are overcrowded; working with MCPS to ensure that District 1 schools receive their fair share of modernization funding; and supporting 99% of the school system’s operating budget requests. From speed bumps to modern elementary schools to sustainable transit policies, Roger's focus has been and will continue to be protecting the community we love and preserving our quality of life. Following is a press release from MCEA opposing the shift in teacher pensions that was passed by the Senate. The release contains some pointed language directed at Senator Rich Madaleno (D-18), who authored the proposal and has been known as one of MCEA's best friends over the years. The Montgomery County teachers union today decried the last minute maneuver in the State Senate to shift hundreds of millions of dollars in state pension costs onto local counties. The union is mounting an intensive grassroots lobbying effort to convince Montgomery County delegates to the General Assembly to oppose the proposal. “There is no other issue that unites everyone in Montgomery County as much as opposition to the shift in pension costs,” said Doug Prouty, President of the Montgomery County Education Association (MCEA). “Liberal or conservative, Democrat or Republican, pro-business or pro-labor, MCPS advocate or MCPS critic – everyone understands that shifting pension costs has a disproportionate impact on Montgomery County.” The pension funding formula is the only state aid program that favors Montgomery County. The Senate proposal would shift $13 million in state pension costs onto Montgomery County in FY12, with the amount growing to $70 million a year by FY15. Seven of Montgomery County’s eight state senators voted against the proposal. Prouty pointed out that the proposal is being rammed through at the last minute. The amendment surfaced for the first time last Thursday. It was voted out of committee on Friday, and passed the full Senate on Tuesday. Governor O’Malley had not included the pension shift in his proposed budget, and there had been no proposal to do so during the first eight weeks of the legislative session. The state government controls the benefit levels in the pension plan. The state government controls the investments of the pension funds. Prouty says it makes no sense to require counties to pay pension costs for a pension plan they do not control. 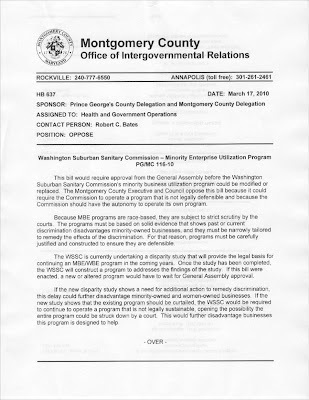 The commissioners of the Washington Suburban Sanitary Commission (WSSC) have been told by their general counsel that the agency’s current minority contracting program is illegal. That doesn’t sit well with the Prince George’s County Delegation, which is devoted to the program and its beneficiaries. So they have a solution: they want veto power over what WSSC will do. And they are very, very close to getting what they want. Minority contracting is big business in Prince George’s County and especially at WSSC. 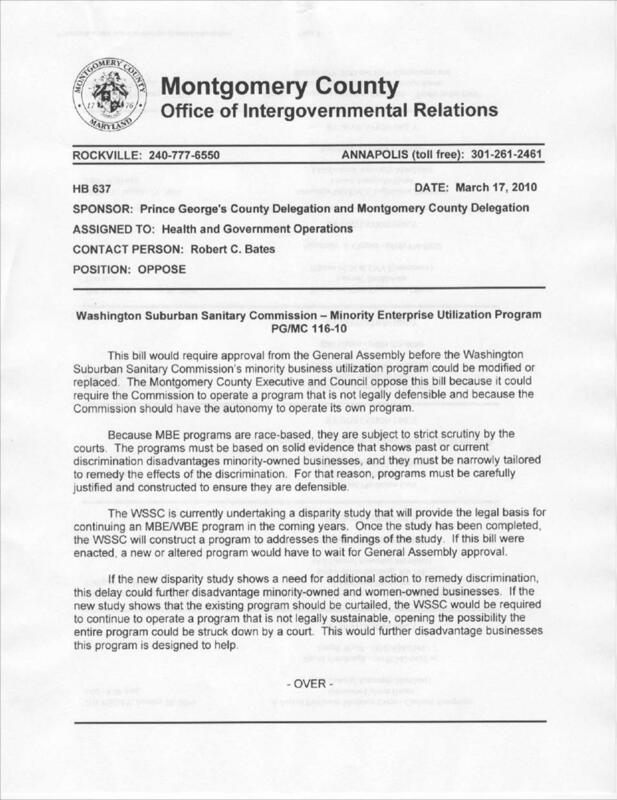 Prince George’s County has a history of sending aggressive defenders of the program to occupy its three seats on the WSSC’s six-member board. In fact, one of the county’s current commissioners is himself a minority contractor who has done business with the agency. The Prince George’s commissioners’ obsession with minority contracting runs so deep that the issue dominated a 12-hour board meeting held after the monster River Road pipe break last year, which was not discussed. What started as a program to protect struggling, small minority businesses decades ago has turned into a protection system for big, politically-connected companies looking to keep their piece of the pie. That’s because in thirty-two years of existence, WSSC’s minority contracting program has never graduated a single firm. According to commissioners, a legal analysis delivered to them in closed session Wednesday concluded that the WSSC’s minority business enterprise program violates the U.S. Supreme Court’s 1989 ruling, in City of Richmond (Va.) v. J.A. Croson Co., that preference programs are unconstitutional unless based on a finding that the beneficiaries otherwise lack access. Of course, these contractors have had thirty-two years of access! And their political contributions get them a WHOLE lot more access than the average Joe on the street. WSSC has known that its minority contracting program has had problems for at least five years but its commissioners cannot agree on how to fix it. 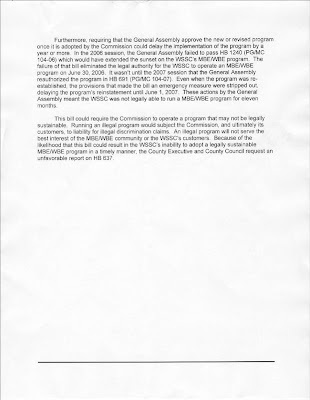 The three Prince George’s commissioners almost always deadlock with the three Montgomery commissioners, so the current illegal program has been extended again and again. But the legal counsel’s naked declaration is forcing the issue to a head and that alarms state legislators in Prince George’s County. After all, some of them depend on minority contractors for cash and political support and their interests must be protected. So Prince George’s County Delegate Aisha Braveboy (D-25) and Montgomery County Delegate Herman Taylor (D-14) introduced local bill PG/MC 116-10, which prohibits WSSC modification or approval of a new minority contracting program without General Assembly approval. In this case, that means approval by the Prince George’s delegation, the Montgomery County delegation and finally the General Assembly as a whole. Both lead sponsors have an angle. Braveboy has sought to cast herself as a champion of minority contractors and would like to use the issue in a potential challenge to Senator Ulysses Currie. Taylor is running for Congress against Donna Edwards and is looking for ways to build a base in Prince George’s County. Most MoCo legislators care little or nothing about minority contracting. They see it as a Prince George’s issue. If Braveboy and her delegation are jumping up and down about it, why not just give it to them and try to get something for it later? So the MoCo delegation voted in favor of the bill by 11-10, but it did not pass because it needs a majority of the delegation’s twenty-four members, or 13 votes, to get approved. Delegates Al Carr (D-18) and Tom Hucker (D-20) were absent. But the issue is not yet dead. Braveboy and Taylor are still pushing it and want a new vote, possibly today. If they can get both Carr and Hucker to vote with them, the Prince George’s delegation will get its veto power. WSSC could then fashion the world’s fairest, most legal minority contracting program but if politically-connected contractors squawk, it is going down. That would be very, very dangerous. 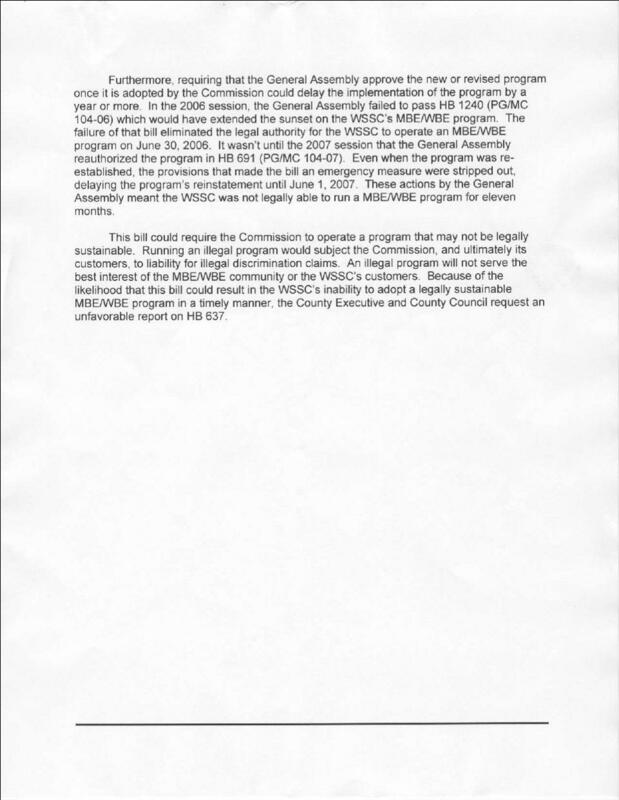 In the wake of its legal counsel’s opinion, WSSC is now knowingly operating an unconstitutional race-based contracting program. That makes the agency a sitting duck for any non-minority contractor looking to sue. And if there is a class action that covers a period of years, well… the liability will be incalculable. And any damages will be paid by you, the ratepayers. That’s right, you. So who’s more important? The ratepayers? Or politicians and their cronies? We’re about to find out. By Lieutenant Governor Anthony G. Brown. Last week, President Obama signed The Patient Protection and Affordable Care Act, one of the most comprehensive and critical pieces of domestic health care legislation in over 40 years. While the challenges at the federal level to pass a bill and expand affordable access to care have been discussed in great detail, the challenges individual states will face over the next three years to implement reform have been underreported. National health reform can only be as good as a state’s ability to implement it. With the right leadership on the state level, health reform can eclipse the original federal intent by greatly improving the quality of care for all patients and reduce health care costs. While Republican leaders from some of our neighboring states have set a course to politicize the progress we made last week, Maryland views health reform as a tremendous opportunity to make us a stronger, healthier and more prosperous state. We’ve felt this way for some time and have taken measures on our own accord to jumpstart reform in Maryland. During the special session Governor O’Malley called in 2007 to address the $1.7 billion structural deficit left for us by the previous administration, we passed the Working Families and Small Business Health Coverage Act. The Act created the Health Insurance Partnership, a tax credit to assist small businesses with the cost of employee’s health insurance and expanded Medicaid to 116% of the federal poverty level. Since enactment, the Act has helped 62,000 previously uninsured Marylanders obtain the coverage that they need and deserve. Last year, the state enacted first-in-the-nation legislation requiring state-regulated insurers to provide incentives for electronic health record adoption. Governor Martin O’Malley, with help from the Maryland General Assembly, is developing a statewide health information exchange – the Chesapeake Regional Information System for our Patients (CRISP) – to collect, consolidate, standardize and redistribute secure medical information. Earlier this month, the U.S. Department of Health and Human Services awarded Maryland with a $9.3 million stimulus grant to help CRISP implement our exchange. We began this year knowing that our State’s top priority was the economy, but that health reform was a necessary component to securing our economic future. Federal reform is estimated to save Maryland $1 billion over the next ten years. As the O’Malley-Brown Administration’s point person for health issues, I have spent the past six months meeting with health experts and touring our hospitals, clinics and private practices to ask doctors, nurses, patient-advocates and administrators what policies and programs would be needed for Maryland to implement health reform by 2014. During my discussions, health professionals statewide emphasized that reform must include the expansion of information technology and Maryland’s health care workforce. States have an incentive to develop more comprehensive health IT systems and encourage electronic health record adoption. Americans deserve the highest quality of care. More reliable and secure electronic health records will provide doctors and nurses with patients’ complete medical histories and the ability to conduct more comprehensive and efficient analyses and diagnoses. Health IT also provides hospitals and physicians with more accurate billing practices, and reduces medical errors and duplicative procedures, the combination of which reduces cost and improves the quality of patients’ care. One of the most fundamental obstacles in states’ implementations of health reform will be to put in place the necessary workforce to meet the additional health care needs of a larger community of insured patients. In Maryland alone, more than 400,000 uninsured citizens will receive coverage due to the federal legislation and the state will need to train and employ thousands of additional nurses and physicians to meet their needs. We are leaning on our network of community colleges and undergraduate and graduate institutions to train new workers to meet the medical, clerical and IT demands of the federal legislation. To encourage more physicians to pursue employment in primary care, the O’Malley-Brown Administration has introduced legislation to establish a Maryland Patient Centered Medical Home program that places a premium on spending time with patients, emphasizes wellness and prevention, and coordinates patient’s care. This patient-centered approach has shown great promise towards improving the quality of care, reducing health costs and changing how care is delivered. Last week, Governor O’Malley signed an Executive Order establishing the Health Reform Coordinating Council that will be responsible for coordinating existing State programs and resources with the federal reform. He’s asked me to chair the council, alongside Health and Mental Hygiene Secretary John M. Colmers. Together, we’ll address the full range of challenges presented by health reform and develop a strategic plan for implementing reform in Maryland. We will interpret the federal mandate in order to prepare for the expansion of Medicaid, reform the individual and small group markets, expand innovative pilots, establish a statewide health insurance exchange and examine how to leverage our strengths and improve weaknesses. Most importantly, we will develop a model that makes reform a reality and improves the efficiency and quality with which we provide care and reduce costs for Maryland’s taxpayers. Health reform is long past due and President Obama’s political courage to take on such a controversial and complex issue is laudable. Still, any national effort to make transformative change must be complemented at the state level and true reform will only be as good as a state’s ability to implement it. Maryland, for one, embraces this historic opportunity. Anthony G. Brown is Maryland’s Lt. Governor. His policy portfolio includes the O’Malley-Brown Administration’s efforts on health care, economic development, higher education and veterans affairs. He previously served as Majority Whip in the Maryland House of Delegates while representing Prince George’s County. Fill In That Census Form!